The bench press has become the most popular weight training exercise across the globe. Master the perfect bench press technique with tips from the experts. Dr Shepard and his team, Bigger Faster Stronger (BFS) have just released the third edition of their book Bigger Faster Stronger. In it, amongst other lifts, they discuss the bench press. This post will help you master the perfect bench press technique. BFS recognise that the bench press can be a valuable exercise. Want stronger arms, chest and shoulders? Then the bench press is a must. And although there are bodybuilders who have gotten away with not performing the traditional bench press or have reached such levels of muscle bulk that they need to focus on other exercises, the bench press is great for building size. At BFS, they have a little different perspective. The BFS programme is not a workout designed for powerlifters but rather for athletes who compete in multiple sports and those interested in developing physical fitness. Certainly, we encourage making steady improvements in this lift, but not at the expense of other exercises. To perform a dozen or more sets of bench presses several times a week, as is often the case with competitive powerlifters, would detract from working on other lifts or additional aspects of athletic conditioning such as agility or speed. Plus, focusing on just one exercise performed in the same manner increases the risk of overuse injuries. Besides, any athlete who wants to be strong at all angles needs a larger selection of pressing exercises. In an attempt to use more weight, many athletes will use an especially wide grip. Grip width was the subject of a study published in the May 2007 issue of the Strength and Conditioning Journal (Green and Comfort). Researchers found that a grip wider than 1.5 times the biacromial width dramatically increases stress on the shoulder. Biacromial width is defined as the distance between the acromion processes, which are the highest points of the shoulder. Also, the researchers found that using such a wide grip was not necessary, as it did not influence the recruitment of the chest or shoulders. A thumbless grip is often used by top powerlifters. Such a grip positions the bar more in line with the lower arm bone and the improved leverage is believed to help one lift more weight. The downside is that this grip carries with it a higher risk, as the bar can easily slip from the hands. Therefore BFS do not recommend this grip, especially not in a youth/high school environment. Secondly, in an attempt to lift more weight, athletes will often use a wider grip, bounce the bar off their chest or use an extreme arch in their lower back. All these techniques carry a higher risk of injury, as such, this should be discouraged. Although BFS do recommend a slight arch in the lower back, athletes with back pain or a history of back problems may have to perform the exercise with the back in a more neutral position with minimal arch. Thanks in part to assistive gear such as bench press shifts enormous weights have been lifted in this exercise—at the time of writing several men have lifted over 1,000 pounds (454 kg) and two women have benched over 500 pounds (228 kg). However, BFS see little reason to use such equipment, other than possibly to accommodate an injury that is being treated. It must be stressed that the bench press is the most dangerous exercise that can be performed in the weight room—in fact, many individuals have died performing the lift. Serious injuries can result when spotters are not used, if they are improperly trained or are simply not paying attention. A strength coach should not assume that an athlete knows how to spot—coaches should have all athletes demonstrate proper spotting techniques before they are allowed to lift. Although a single spotter is usually sufficient, BFS recommends three spotters (one behind the lifter and one on each side) whenever possible, especially when very heavy weights are used. If an athlete is lifting by himself or herself, which we do not recommend, then the exercise should be performed inside a power rack with safety pins. The pins are there to catch the weight in case the athlete loses control of the lift or cannot complete a repetition. Equipment should have firm upholstery to prevent the athlete from slipping. The supports should have a wide yoke so the bar can be easily returned to the support upon completion. If an athlete is of a height that does not allow his or her feet to touch the floor without excessive arching, then weight plates or some other small platform should be placed under the feet so that the body is stable during the lift. Also, the barbell should have sufficient knurling to allow a firm grip, and chalk should be made available to prevent slipping. Dumbbells can be used instead of a barbell for most bench press exercises. The advantages are a greater range of motion and the fact that the muscles that stabilise the shoulder must work harder. Also, because the dumbbells allow the hands to rotate during the lifts, there may be less stress on the shoulder (such as by rotating the hands so that at the bottom of the exercise they are in a neutral position: hands facing each other). However, this instability also means that less weight can be used; therefore, the effect on strength and muscle development is decreased. Now let’s look at the basic principles of sound technique. Having proper position during the bench press is extremely important in preventing injuries and being able to get the most strength training effects from the exercise. Start with your body positioned so that the barbell is directly over your eyes. This position provides enough clearance to prevent the bar from hitting the uprights or safety catches as you perform the lift. Spread your legs wide, which will give you more stability and place your feet flat on the floor and under the knees. A common fault of novice lifters is lifting the feet off the floor during the bench press, which destroys the firm foundation necessary for maximum effort. Next, place your hands on the support standards and push your shoulders down toward your hips. A slight arch should be present in the lower back, with your chest sticking up as high as possible. Although this position may be a little uncomfortable at first, it gives the best mechanical advantage and reduces the possibility that you will lift your hips off the bench. The spacing of the hands affects the position of the elbows, which in turn affects the muscles the exercise will develop. A wider grip moves the elbows away from the body and places more emphasis on the chest. With this grip, the elbows should be at a right angle when the bar is touching the chest. A close grip forces the elbows in, placing more emphasis on the triceps. Most champion bench-pressers and competitive powerlifters use a wide grip. But few sports involve the use of the arms in a wide position, therefore this is less functional. Similar to the parallel squat, the bench has four main phases: the start, the descent, the pause on the chest and the upward drive. You must concentrate on perfect technique during all parts of the bench press to achieve maximum results. Have a spotter help lift the weight so that it is positioned directly above the lifter’s throat. The spotter should not remove the hands from the barbell until the athlete has secured the weight on extended arms and the barbell is motionless. During this phase, the elbows will be pointed more directly to the side with a closer grip than when using a wider grip. The lifter should always spread the chest, lock in the lower back and look at a target. Now press the barbell upward and slightly back, towards the throat. Continue holding your breath when beginning the upward drive from the pause position and then exhale as the barbell passes the hardest position of the lift or the sticking point. Your eyes should remain fixed on the barbell throughout the entire upward drive. When you complete the set, the spotter should grasp the barbell and help you return it to the supports. Take a deep breath as the bar comes down. Hold your breath just before the bar touches the chest and up to halfway through the upward movement. At that point you can let the breath out forcefully. Some lifters make loud sounds as they force their breath out. This method keeps everything firm and may have some psychological benefit, especially when performing multiple reps.
Before a max attempt, the technique of squeezing the bar tightly can help, often adding about 5 pounds (2 kilograms) to how much can be lifted. This technique may also reduce stress on the elbows. If the bar reaches a sticking point, the lifter can sometimes just concentrate on the weaker arm to cause the bar to lock out. 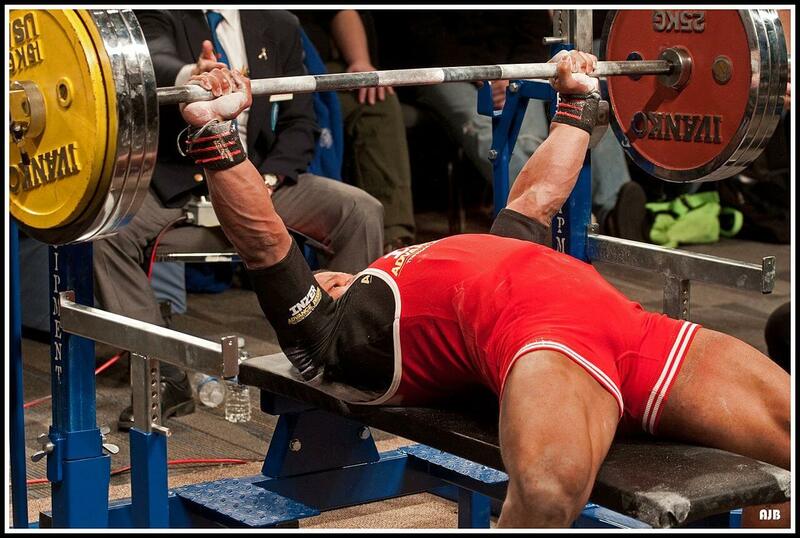 Some lifters strain with their eyes closed, which is a mistake. The eyes should always be open and focused on a point directly overhead. Correct spotting is especially important to prevent accidents during the bench press. As a general guideline, a spotter in the middle can provide a more even lift off and more control over the spot. With heavier weight, such as 300 pounds (136 kilograms), two spotters should be used for the lift off. These are all discussed in the book Bigger Faster Stronger. The book also discusses other strength exercises such as squats and the variations and depth. As well as deadlifts and why you should use the Hex Bar. The book is designed to help athletes and as a result, it has some excellent chapters on speed, agility and flexibility.